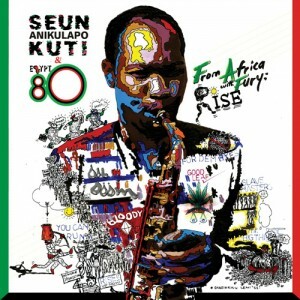 Seun Kuti and Egypt 80 - "From Africa with Fury-Rise"
Fela's youngest son is back with his second full length record and this one was recorded in Brazil and mixed and produced in London by none other than Brian Eno. I recently saw the band live at the Roskilde Festival and was blown away. I was so happy to get this double vinyl release. There are two songs on each album side, with the songs all between 5-8 minutes or so. Not as short as Femi, his older brother, but not as stretched out as his dad's songs. But he has the groove and writes some great and powerful political and socially conscious lyrics on this record, which has a great sound. My favourite tracks are Slave Masters, which has a totally cool and almost hypnotic groove that I get sucked into every time. All the tracks are pretty up tempo except the track Rise, which slows things down a bit. The track The Good Leaf is Seun's own tribute to marijuana which his father was also fond of. It is a really excellent record and one of my top 10 this year. Get it.